Fill out our online form to request an IMPM urethane sample key ring. 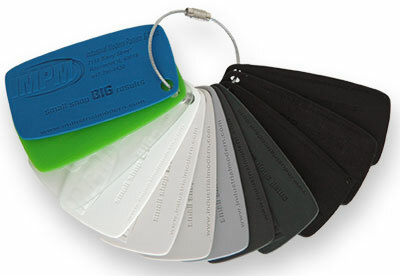 The sample key ring displays 12 of our most commonly used urethanes, as well as both of our SLA materials with a “Strip and Ship” finish. All urethane samples were cast in color (clear as well) in our silicone tools and display the level of detail possible to achieve with our silicone tooling process. On the back of each urethane sample is an example of a texturing option available here at IMPM. Along with the sample key ring, you will receive a urethane guide chart that displays all of the mechanical properties of the urethanes on the key ring and a reference chart that displays the mechanical properties of common plastics. Reading a chart that displays material properties is a good start, but being able to hold a product in your hands and experience the feel of it is a useful luxury.